Offering you a complete choice of products which include variable pitch pulleys, agriculture variable speed pulleys, v belt variable centre drives, fixed center drives and variable center drives. 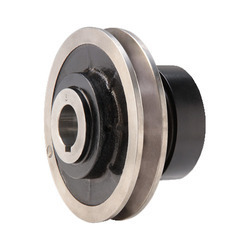 We bring forth our vast industry experience and expertise in this business and offer a diverse range of Variable Pitch Pulleys to our esteemed customers. This product is widely used in the various factories to approximate the full motor load with the unit. 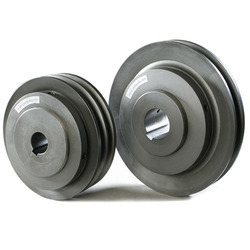 Furthermore, to cater to the diverse requirements of customers, we offer these pulleys in variegated specifications. Variable Pitch Pulley for speed variation ratio of 1:1.3. Standard V belts used for the drive. Vary the speed by changing the pitch diameter of the belt on the pulley by adjusting the pulley disk and the belt tension. These pulleys are applicable where seldom and minor speed variations are required. Available for belt section A,B & C in single and double grooves. 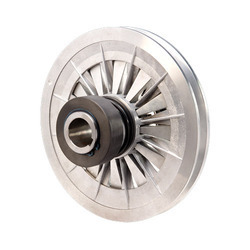 With our rich industry experience and knowledge, we are engaged in offering high quality Agriculture Variable Speed Pulleys. 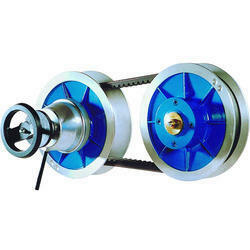 This pulley is widely used for transmitting torque from one shaft to another. It is manufactured by our experienced professionals utilizing quality fine quality raw materials in sync with the set industry norms. 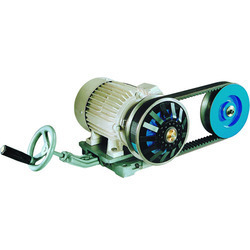 In addition, this pulley can be customized as per the information provided by our customers. Specially designed for a demanding application like agriculture. With features like – No maintenance required – lubrication free drives, available for both Wide V belts and Standard V belts, wide speed ratios. Our variator drives are reliable performers in the dusty and demanding application. Apart from our standard products we can also build variators to your specifications and design. V-Belt Variable Centre Drive for speed variation ratio of 1:3. Standard V belts used for the drive. Vary the speed by changing the centre distance between the V-Belt Variable Centre Drive (driveR) and the Fixed Pulley (driveN). The sliding connection between the Variable Center Drive hub and disks is through a coated round hub guide. No maintenance required, lubrication free. Available for power rating from 0.37 Kw to 5.5 Kw. To meet various requirements of our clients, we are engaged in offering an extensive array of Fixed Center Drives, which is manufactured using high quality basic material and advanced technology by our experts. In order to deliver flawless range to clients, the entire assortment is strictly verified on different parameters. The offered product is available in different dimensions and specifications as per the variegated specifications provided by the clients. Available for power rating from 0.18 Kw to 45 Kw. Variable Center Drive for speed variation ratio of 1:3. Wide V belts used for the drive. Vary the speed by changing the centre distance between the Variable Center Drive ( driveR ) and the Fixed speed pulley (driveN). The sliding connection between the Variable Center Drive hub and disks is through serrations. Power is transmitted by wedging action of the belt by means of specially designed basket shaped springs. Periodic greasing required. Available for power rating from 0.18 Kw to 18.5 Kw.